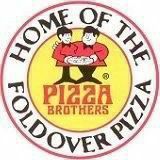 "We had a Pizza Brothers in Findlay back in the '80s, and my family loved the roast beef foldover and the taco foldover. The drive here was over 1 1/2 hours, but well worth it! Amazing food and wonderful service!!" "Awesome pizza and services. And it's my favorite place to go." "Very good n will revisit also had at a house warming dinner n they liked n will go to thank u"